Although in 2014-15 this is something which is developing in its significance for schools, it is not something new at St Philip Neri Primary School. British values are promoted in so much of what we do, not least during our school assemblies, Religious Education and Social and Emotional Aspects of Learning. The values are the integral to our long-standing ethos statement which complements British values and always has done. 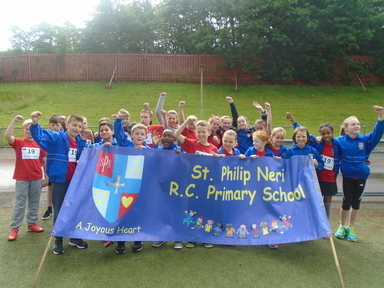 At St Philip Neri we assist pupils to acquire an appreciation of and respect for their own and other cultures in a way that promotes tolerance and harmony between different cultural traditions. As well as actively promoting British values, the opposite also applies: we would actively challenge pupils, staff or parents expressing opinions contrary to fundamental British values, including ‘extremist’ views. Below are just a few examples of how we promote British values. The first section is a general overview; the others are specific expectations set out by Ofsted. As a school, we value and celebrate the diverse heritages of everybody at St Philip Neri Primary School. Alongside this, we value and celebrate being part of Britain. In general terms, this means that we celebrate traditions, such as customs in the course of the year; for example, Harvest festival during the Autumn term, and what could be more British than a trip to a pantomime around Christmas time! We also value and celebrate national events, a recent example being the Royal Wedding in 2011 and the Olympics in 2012. Historically: “What it means to be British” is a whole-school topic. The main focus is British history. During the topic, children learn about an aspect life and how this has developed and changed over time. The actual topic depends on the interests of the children (and teacher! ), but might include inventions and discoveries, or houses, or medicine. Children, parents and staff have many opportunities for their voices to be heard at St Philip Neri Primary School. Democracy is central to how we operate. An obvious example is our School Council. The election of the School Council members reflects our British electoral system and demonstrates democracy in action: candidates make speeches, pupils consider characteristics important for an elected representative and pupils vote. Made up of two representatives from each year group (1-6), the School Council meets regularly to discuss issues raised by the different classes. The council has a budget and is able to genuinely effect change within the school; in the past, the School Council has planned the playground area and organised many charitable events in school. The importance of rules and laws, whether they be those that govern our school or our country, are referred to and reinforced often, such as in assemblies and when reflecting on behaviour choices. At the start of the school year, each class discusses and sets its own Class Rules, a set of principles that are clearly understood by all and seen to be necessary to ensure that every class member is able to learn in a safe and ordered environment. Our pupils that respect is shown to everyone, whatever differences we may have, and to everything, whether it is a school resource, a religious belief or whatever. Children learn that their behaviour choices have an effect on their own rights and those of others. All members of the school community should treat each other with respect. Sadly, no school can guarantee that there will never be instances which are contrary to this value. At St Philip Neri Primary School, such instances are extremely rare. Our pupils are encouraged to know, understand and exercise their rights and personal freedoms and are taught how to exercise these safely, such as in our e-safety. Guidance for Catholic schools can be found on the link below on the Catholic Education Service website.